Treats from the Mediterranean Bakery. 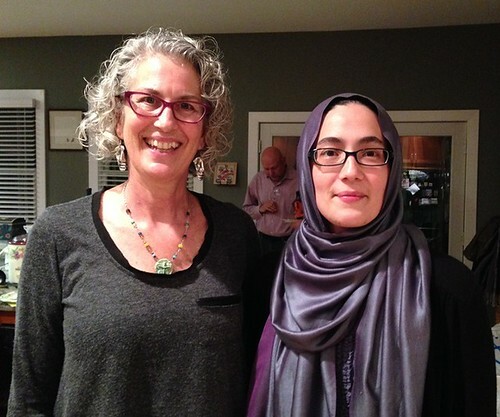 On November 2, guests enjoyed hot fruit cider, middle eastern pastries, minestrone soup, and great company at Kate Tindle’s 9th annual house party in Alexandria, Virginia for Teaching for Change. About 40 people came to learn about and support the work of Teaching for Change. In a formal presentation, Kate Tindle welcomed the guests with her new hat as board chair. She then introduced Teaching for Change executive director Deborah Menkart who shared photos and video highlights from the past year, including the McComb, Mississippi students’ film on the voting rights struggle. She then unveiled a new initiative of Teaching for Change — a fellowship program to match people with specific skills to social justice curriculum needs. Attendees met 2013 fellow Alison Kysia who described her interest in developing resources for high school world history classes from a people’s history perspective. The event raised $4,235 for Teaching for Change and more donations are coming in. (Our thanks to the Mediterranean Bakery on S. Pickett St in Alexandria for sweet and savory contributions).